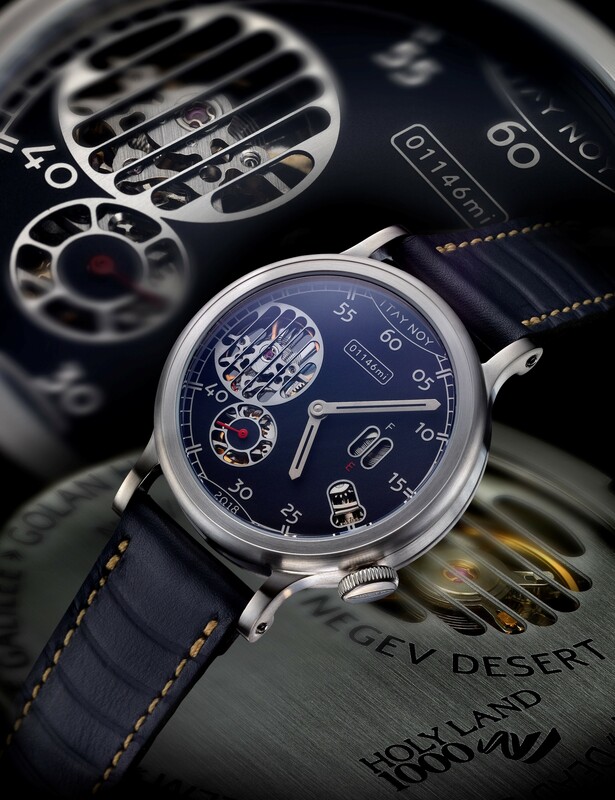 This is a -truly- unique timepiece, born out of close collaboration between the event organizers and Itay Noy, Israeli’s premier fine watchmaker. Conceptualized, designed and crafted by Itay in Israel, this watch aims to capture the spirit and vision of the Holyland1000. Subtle in design and crafted using only the finest materials and techniques, this absolutely limited series of 40 watches are as unique as the tour we are all about to enjoy. Work on the watch started some months ago, when the opportunity to collaborate with Itay Noy came about. Itay studied closely the style and ‘design language’ of classic motoring icons, aiming to produce a watch from the ground up, that captured the qualities and lifestyle of our hobby and this event in particular. Using old-world techniques, Itay’s craft is superb and truly bespoke, featuring Holyland1000 specific touches both front and back. We started with the choice of font the watch, the ‘Alef’ font, is a recently developed font in Israel, its as Israeli and special as our tour. The face has been designed to echo the spirit of the event with a Mileage Counter box within which the number of miles that the Holyland1000 will cover is clearly displayed, through the car grill mechanism see-through, the piston-like hand winding mechanism, and the power reserve depicted as a fuel gauge. The ‘2018’ prominently displayed at the bottom of the dial, representing the ‘2018’ tour. The subtle design continues on the back of the watch, with an open grill displaying the mechanism, through the graphic depiction of the route we will be covering, the Rally’s Logo and of course, the serial numbering of the watch out of a limited series of 40. Should you have an interest to purchase or simply learn more, we urge you to contact Itay Noy via the email itaynoy1@gmail.com. Although the series is limited to a total production of 40, Itay kindly agreed to manufacture 15 watches to be ready in time for the event, and they will be available on a first come first serve basis (pre-order). The balance of the series will be completed upon order. We would like to emphasis that the organizers will not generate any benefit whatsoever resulting from the success of the collaboration with Itay’s to create this special timepiece. We feel privileged that an artist of Itay’s caliber has cooperated with the HolyLand1000 to produce a masterpiece of Horological art.